Knowledge is not only power but also a source of creativity. What I mean is that a knowledge of photographic history can be an inspiration in spotting photographic possibilities. I’d like to share a recent example (for another see Walk the line: taboo subjects in street photography). It’s a succinct and readable account. The opening two chapters provide an overview of the challenges of constructing a history of photography (Ch.1) and a primer on some of the established methods of theorising photography (Ch.2). Subsequent chapters examine the history and aesthetic conventions of different genres using the tools and concepts from the opening chapters. I have read many books on the history and theory of photography, so reading Bate’s book was a bit of ‘infilling’. I’m sorry it took so long to get around to it now. In the course of chapter two, Bate illustrates the insights from applying different photographic theories – realist vs. semiotics – by analysing the image below. 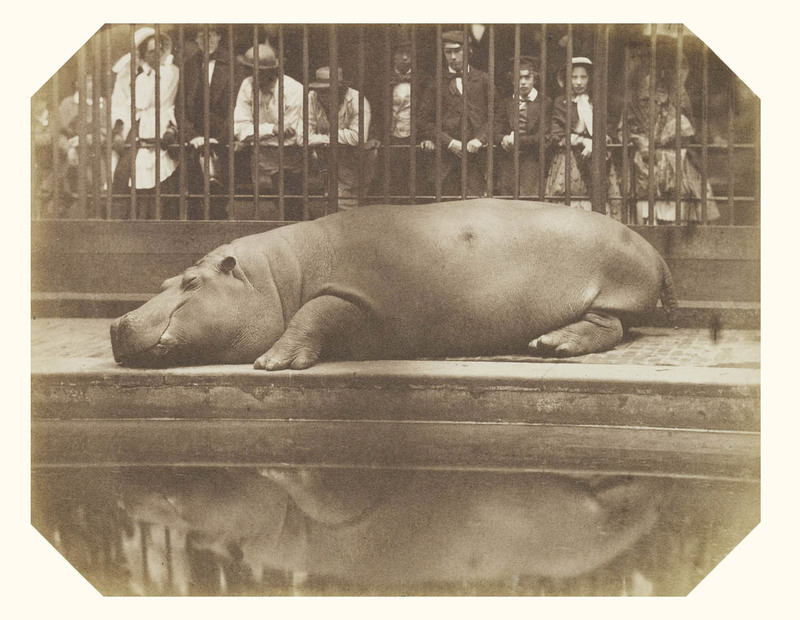 It was taken around 1855 by the Spanish aristocrat the Comte de Montizón at Regent’s Park Zoo. The Hippopotamus at the Regent’s Park Zoo, ca. 1855. By the Comte of Montizón. 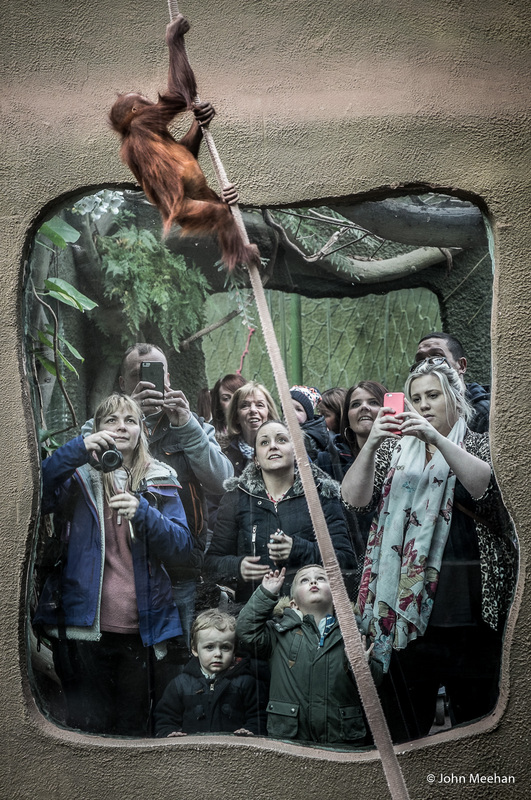 Back to the future: Last week I was photographing the animals at Chester Zoo (UK). Thanks to the encouragement of my f50 colleague Peter Barton, I have been doing a lot more of late. I have always been interested – not so much in straight wildlife photography, but more in an interpretive approach akin to portraiture and abstraction. The usual MO is to disguise that I am at a zoo by eliminating signs of the man-made environment, and fellow visitors, from the frame. However, one situation presented itself that immediately reminded me of that Regent’s Park shot from the early days of photography. The image below is the result. Zoo stories, 2015. Copyright John Meehan. While this image presents a rather obvious irony, the real story for me was to observe how gently the family of Orang-utans interacted. The collective care and attention they showed that little infant, as he took his early forays into the upper reaches of the enclosure, was an obvious contrast to the jostling of the visitors at the zoo. The slant in the ‘rope’ in the shot, for instance, is the result of what I presume was the youngster’s mother holding the bottom of it in case she needed to intervene (she watched all the while) if he got into difficulty. She needn’t have worried, he did just fine. It is tempting to think his act of defecating from a great height as he passed the onlookers was an expression of disdain, but perhaps not. Come to think of it, he did navigate across the top of the enclosure towards an adult eating an orange and stole the fruit from him. So, maybe he really was that mischievous little rascal I wished him to be. This entry was posted in Blog post, Picture story by John Meehan. Bookmark the permalink.